Before and After. The top image is from 2007 courtesy of Google Earth; it shows the road named Granby Way surrounding Granby Green. Park Avenue is the road on the right. The large building at left with a white roof is Marlborough House tower block. Redevelopment took place shortly after this image was taken, to the south of the Green, and of the Green itself - as seen in the lower image taken 2012. Granby Way, north side, Rear of the same council flats c2009. The two images above show the front and rear of the council flats on the north side of Granby Way. These flats, and similar types built on the plot behind, were constructed between 1957-1960, on the site of Granby Barracks. (On the western half of Granby Barracks that is - the eastern half being on the other side of Park Avenue). Parts of Granby Barracks survived WWII and were still in use by the military during the 1950s, but being in run-down condition nearly all were demolished by 1960 and the last few disappeared by the mid 1960s. (The NAAFI building remained and was subsequently used for community purposes) The Army returned the land to the city, which a) being desperate city-wide for housing sites, and b) attempting to rebuild war-torn Devonport, built these flats. These post-war flats had a life-span of just over 50 years, since this whole plot on the north of Granby Way, the western half of the ex Granby Barracks plot, is currently due for redevelopment once again, as part of Devonport's Regeneration programme. Now, at 2012, many of the maisonettes/flats to the rear of the above block have been vacated in preparation for demolition and rebuild. Marlborough House was completed in 1974; it is 12 stories high and contains a two-bedroom flat on each corner of each floor of the building, the rest are one-bedroom flats. Above: A side view of Marlborough House at 2009. The railings at left of the photo are on the spot where the temporary post-war F.W.Woolworth stood before relocating to Marlborough Street - which after 1957 became the site of South-Yard dockyard gate. The dockyard gate has since been resited and is now out of view (20-30 meters behind the photographer). Author's memories:"Prior to Marlborough House being built I can recall there being a public house on one corner of that stretch of road facing Granby Green - it was either called the Two Trees or the Two Triangles. On the other corner, nearest South Yard dockyard gate, once stood the Co-op building. I recall being in the Co-op with my mother when I was around five years old (early 1950s). When she paid for her items the assistant placed the money in a contraption attached to wires which shot upwards out of site, and returned a few minutes later with a receipt inside. It was a tubular thing, I don't know its name, but all money was taken this way at that shop. When the Co-op closed the building was used for a while by a dancing studio. I learned to cha-cha-cha at this studio when I was sixteen. 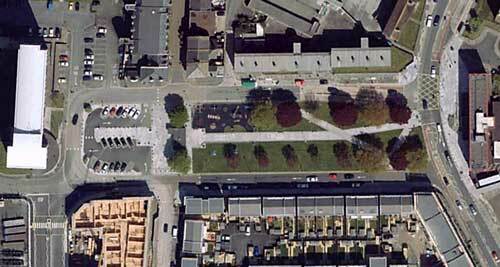 That very spot is now the site of the ground-floor semi-circular community room of Marlborough House. In the middle, of this same block then facing Granby Green, was a fish and chip shop, and nearby, but closer toward Granby Gate, an old chap would stand every day selling the Evening Herald newspaper from a stand. I can also recall, was it late 1965 or during 1966....?, Dr David Owen canvassing for votes around here, and once or twice saw him talking to various persons at Granby Gate itself - I remember thinking how good-looking he was. I believe he was trying to attract the vote of Yardies, of whom hundreds used to leave work through Granby Gate in those days." (a) The original name of the road on the south side of Granby Way was Princes Street (sometimes mistakenly written as Princess Street). Most of the original properties in Princes Street suffered war damage beyond repair (from WWII) and were demolished; of the few remaining, parts of their walls and one or two windows, were walled-in with the 1957 dockyard wall that was built along Princes Street, as can be seen in the next image. (the wall continued down Chapel Street forming the perimeter of what became the admiralty's South-Yard Enclave). 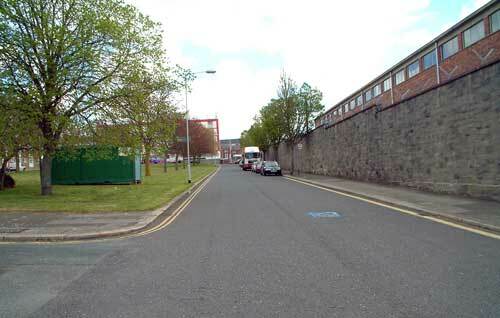 Before and After of the 1957-built dockyard wall at Granby Way, to the south of the Green. ABOVE was taken at 2006, BELOW taken 2009. Once the 1957 wall went up, the section of pavement alongside it, shown in the images above, received little use for the next 50 years. Apart from Yardies leaving via Granby Gate and going home at the end of their day, or North Corner residents occasionally walking up to the Forum for bingo, very few pedestrians traversed that pavement; for five decades the south side of Granby Green was simply somewhere to park the car, with little other function. The wall remained in-situ until 2007 when it was demolished by Redrow Homes. Redrow were the developers chosen to rebuild the South-Yard enclave. Demolition of this particular wall was a big event for local residents. They celebrated its disappearance. It was disliked. It was not an historic wall, of which Devonport has many and of which residents are proud. It was thrown together hastily with breeze blocks. It is not missed. Following the wall's demoliton, the first row of homes built by Redrow, in the first street rebuilt and brought back into everyday use after the admiralty had returned the enclave, was here on the south side of the Green. The former name of Princes Street for this stretch of road to the south of the Green can still be seen on early 1950s maps, but from 1957 onward, maps show the name Granby Way. There did not appear to be a formal renaming, nor community consultation, nor official publication in newspapers of the name change? After 1957 it simply became referenced as Granby Way on maps and city documents. Although, people older than me often still refer to it as Princes Street. In truth it may not be that 'simple', but no formal documentation has been found by the author. In fact, Princes Street still exists, albeit now truncated, and is marked on modern maps (including Google maps); but what was once its eastern end is now the whole of it, and is located just a few yards east of Granby Way, behind The Forum (in the far distance of the above image). Even the western end, that short stretch abutting Marlborough House and last referenced as Princes Street on a 1963 map, is no longer so referenced, it is now labelled as Albany Street. Oddly, whilst the name Granby Way has been seen on maps since 1957, (for both the north and south sides of the Green), when the new Redrow homes were publicised, it was stated in the newspaper article that the street had no name as of yet....? Whilst that statement correlates with my view that there was no official/formal renaming of the road, it doesn't correlate with the fact that the name Granby Way has been shown on maps for decades. Furthermore, it has never been made clear why the orignal name Princes Street wasn't continued with? 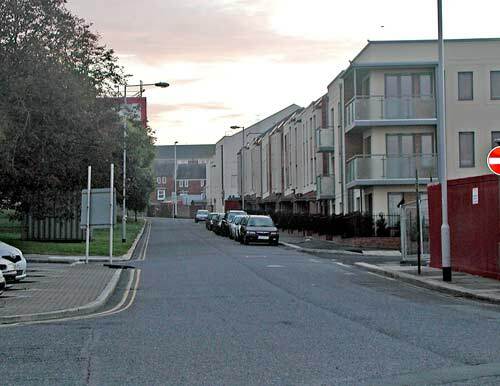 In May 2007, Redrow released the first of the new Granby Way homes for private sale, (a few, at a later date, were for Housing Association rental). On Saturday 12th May they held a sales day supplying potential customers with refreshments, a live jazz band and children’s entertainers. At this stage the terraced properties were being sold ‘off-plan’ and those first buyers later moved in during 2008. Not many of the four-bedroom homes sold though, as most of them were still for sale at the end of 2008. The first person to physically move-in was David Gummer, a Redrow employee. David, a construction worker on the site, moved into the ground floor corner flat in August 2007. Redrow held a formal launch event when their Granby Way homes were fully completed; this took place on Saturday 8th March 2008. All new homes on the Redrow plot, that is, the South-Yard enclave redevelopment, are marketed to buyers under the sales/marketing name of 'Vision. Redrow's aim is to construct 450 homes, shops, offices and facilities across the site. 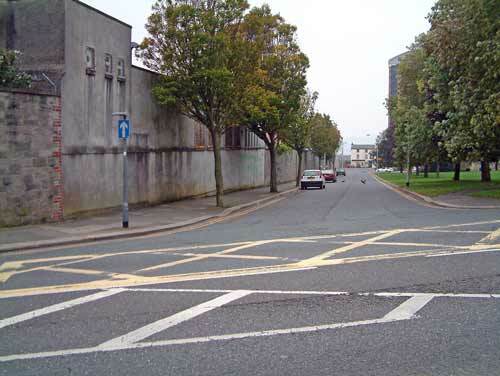 Since this was the first street to be completed on the site. Redrow celebrated the event quite publicly and invited select persons to attend, this included MP Linda Gilroy, a Redrow representative, Devonport Councillors, a DRCP representative, and a few local school-children. In addition Redrow's own mascot was at the launch - a man-sized Buster the Bear. Bill Bannister, a Devonport resident, cut the ribbon at the show-home to mark the launch. Very few residents attended. I was on the Green twice that day, observing the activities, once at the alloted launch time and again an hour later; both times there was barely a handful of additional persons there (beyond the group organised by Redrow that is). During the afternoon there was a display inside the sales office in nearby Chapel Street, which was essentially a self-marketing exercise by Redrow, presenting their past, present and future community-involvement exercises, together with sales information packages for purchasers. For smaller children a balloon artist and a face painter were in the sales office. Another naval person, Mr James Williams, also moved into one of the properties; he'd worked in South-Yard for a while and thought the area was now "unrecognisble". Mr Willams spoke about there being "hundreds of new homes .... with... shops and community facilities on site and great leisure facilities close by." If you are reading this page at some point in the future (it's now May 2012) you may be interested to know of the prices originally achieved for the Redrow terraced homes on Granby Way. At July 2008, when the early group of private purchasers moved into the new homes, prices for the properties were from £118,000 for a one-bedroom apartment and from £180,000 for a four-bedroom townhouse. Here are some sample details from the Land Registry. Note: property prices fell UK-wide between 2008-2012 due to the difficult economic circumstances; Devonport properties didn't escape the problems, their values also reduced over this period. ** Shortly after the £449,000 was paid toward two new buses and bus shelters, Plymouth City Council sold the entire bus operation to a private company - essentially Redrow's community contributions ended up in the asset list of a private company. An Extra Care Home for elderly residents was officially opened on the south side of Granby Way in April 2011 when the first residents moved in . It is a £5.8 million property with 42 flats that have either one or two bedrooms. Residents live in the centre independantly, in their own self-contained flat, but have 24-hour care on hand if they need it. Also, they can choose whether to cook in their own private kitchens or eat in the communal dining room, where meals are cooked by staff. 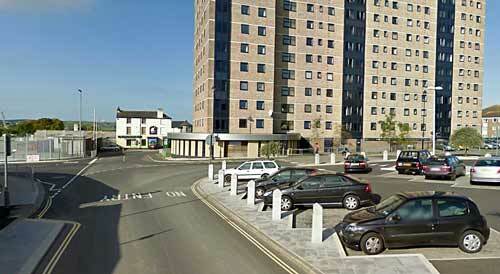 The scheme was developed jointly by Devon and Cornwall Housing Association and Plymouth City Council. According to newspaper reports all the new residents love it there, some even say its better than a posh hotel. Several of the flats have balconies and views of the river. It does sound lovely; there are many luxuries for residents, including: an activity room, hairdressers, treatment room, electric buggy store, courtyard, roof terrace, communal lounge, laundry services and assisted bathroom - on top of all that, there are additional rooms available for relatives or guests to stay. It does indeed sound a great place for elderly persons. The Green itself was updated in summer of 2009; for which a separate page is provided here. 'Yard Site Gets First New Street'. Published in The Herald, 10 March 2008.